Bigness becomes Michael Formanek. An acoustic bassist with a hulking, roomy sound, he has always seemed like one of those musicians whose playing is an extension of his physical self. 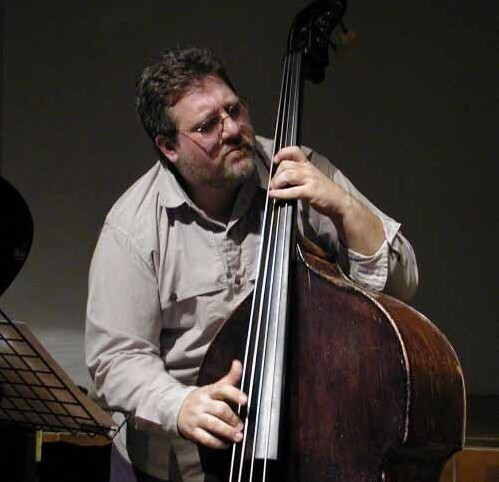 That’s reductive, and perhaps a bit ridiculous, but go ahead and listen to “Diesel Shortbread”-a deep-drone concerto from Formanek’s 1998 solo bass album, Am I Bothering You?-and tell me you don’t hear the virtuoso rambling of one expressly large dude. By that token, Ensemble Kolossus, as Formanek calls his new 18-piece chamber orchestra, suggests the logical embodiment of an idea. A choice assortment of improvisers culled from the experimental ranks in New York, it’s also a big band, with equal weight landing on each word in that alliterative term. The Distance, the band’s impressive debut album, and Formanek’s third as a leader on ECM, often achieves a crushing density of sound-but even during lighter, sparser moments, the music’s center of gravity feels definitively low-slung. If the recent aesthetic signature of the Maria Schneider Orchestra can be said to suggest a wheeling kite, and Darcy James Argue’s Secret Society conjures a complex whir of gears, what springs to mind with Ensemble Kolossus is the galumphing onrush of a charging rhinoceros. Or better yet: the dauntless scuttle of a rhinoceros beetle. I’m thinking along those metaphorical lines partly by tracing Formanek’s evocative lead. “Exoskeleton” is the name he has given to the hourlong suite that takes up all of The Distance, notwithstanding a title track. And he seems to have given serious thought to that idea of a rigid exterior framework, within which individual parts can morph in myriad ways. The first true movement in the suite, after an invitingly shadowy prelude, bears the subtitle “Impenetrable.” It begins with a screaming litany of staccato hits by the band’s brass and reed sections, sharpened with tart chromatic dissonances. 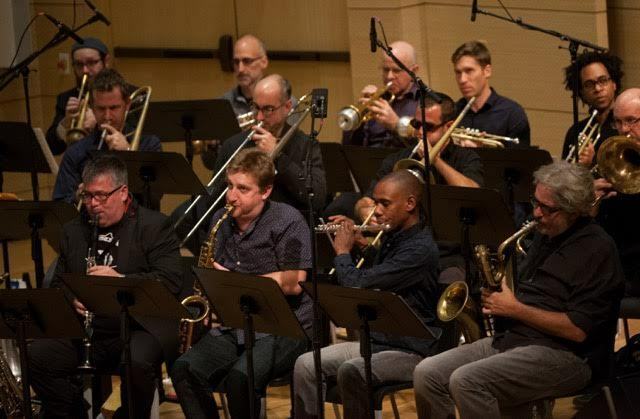 During the band’s NYC Winter Jazzfest performance in January, at the New School’s Tishman Auditorium, “Impenetrable” delivered a hard jolt before shifting into tumbling 13/8 time and a solo feature for alto saxophonist Loren Stillman. As on the album, Formanek powered the band from within, entrusting a peer, Mark Helias, with the task of conducting. The rhythm section, slippery and cool, had Kris Davis on piano, Mary Halvorson on guitar, Patricia Brennan on marimba and Tomas Fujiwara on drums. I was a touch unconvinced when, during the second movement, “Beneath the Shell,” the ensemble sided into an Ellingtonian midtempo. But the supreme ease with which that swinging interlude dissolved into scratchy abstraction, goaded on by Ben Gerstein’s mischief-making trombone, left little room for doubt. To some extent that inside-out flexibility, an intrepid blurring of demarcations, felt like the point. Formanek, director of the jazz orchestra at the Peabody Conservatory, in Baltimore, has an unusual breadth of knowledge when it comes to that sort of blurring. Born and raised in San Francisco, he was working seriously at a young age, joining a version of the Tony Williams Lifetime while in his teens. Not long after arriving in New York in the ’80s, he found regular work with saxophonists Stan Getz and Gerry Mulligan, and a trusted rhythm mate in drummer Jeff Hirshfield. For a few years, the Formanek-Hirshfield hookup was integral to a trio led by pianist Fred Hersch; it also formed the spine of Formanek’s first several solo albums. His 1990 debut, Wide Open Spaces, opens with a brisk walking bassline, over which Greg Osby sketches an alto saxophone solo in fast scribbles and tighter coils. A few years later Formanek released Loose Cannon, a trio album with Hirshfield and a newer coconspirator, Tim Berne, on alto and baritone saxophones. Because I arrived in New York in the late ’90s, I have fond memories involving Formanek with Berne. For a while they formed the growly low end of Bloodcount, a fantastically aggressive band with Jim Black on drums and Chris Speed on tenor saxophone and clarinet. They also worked as a duo, refining a rapport that always struck me as the essence of brotherhood: casual, mock-confrontational, preternaturally locked in. It was no surprise when Formanek enlisted Berne in a chamber-improv quartet that made two sparkling previous albums for ECM, The Rub and Spare Change (2010) and Small Places (2012). Nor does it strike me as odd that one movement of the “Exoskeleton” suite, “Shucking While Jiving,” rests on a driving, lopsided bass ostinato that Berne doubles, and in some way defines, on bari sax. It seems revealing that “Without Regrets,” with its implications of artistic resolve, comes paired with a movement titled “Echoes.” The writing on “Echoes,” a swirl of misterioso brass and woodwind figures over a swinging pedal point, evokes a modern big-band composer like Bob Brookmeyer. Formanek logged time in the Bob Mintzer Big Band, led by one of Brookmeyer’s many acolytes, and I hear this part of the suite as an exacting pastiche, a nod to that corner of the tradition, with a complicated mix of fondness and remove. Hence the pointed grace note of “Without Regrets,” and the fearless enthusiasms of the piece as a whole, which makes the implicit argument that a strong frame will withstand many pressures. At the core of the structure stands Formanek himself: a booming presence, welcoming contradictions, containing multitudes.